When will we recognise Australia’s frontier wars as part of our war history? The 2018 Federal Budget didn’t serve up too many surprises. Photo: Supplied by RSM. Last night we learnt what’s in store for the nation when Treasurer Scott Morrison delivered the 2018-2019 Federal Budget, which didn’t serve up too many surprises. Set to convert our current $18.2 billion deficit into an $11.6 billion surplus by 2020-21, the budget commitments were centred around delivering tax relief, backing businesses to invest and create more jobs, guaranteeing essential services, national security and ensuring the Government lives within its means. With a coalition Government that’s been consistently lagging behind in the polls since late 2016, we weren’t expecting to see anything too controversial unveiled and anticipated some election ‘sweeteners’ in the form of spending and tax cuts to be thrown into the mix—and that’s exactly what we saw. With the unexpected windfall our economy has seen as a result of higher than anticipated revenues, we were forecasting announcements of some big spending on infrastructure projects and increased support for older Australians, so it came as no surprise when the budget delivered on exactly that. Infrastructure projects proved to be the largest area of investment, with a mammoth $24.5 billion in new spending commitments for road and rail projects as part of the larger $75 billion investment over the next decade. Victoria was the big winner with a dedicated $7.8 billion for new infrastructure including $5 billion to build a rail link between Melbourne Airport and the city, while we also saw some new national infrastructure initiatives designed to reduce congestion with the $3.5 billion Roads of Strategic Importance package and $1 billion Urban Congestion Fund. 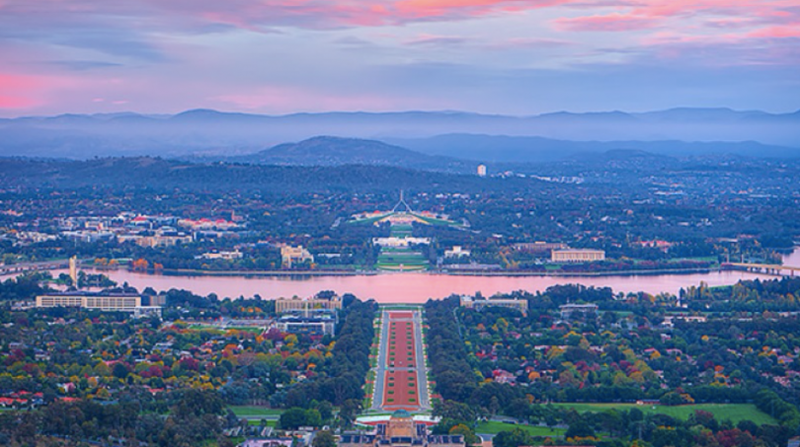 In the ACT, infrastructure spending will include $100 million for the Monaro Highway upgrade to reduce congestion and improve safety, along with $67 million for the Capital Metro under the Asset Recycling Initiative. As expected, support for older Australians also featured heavily, with $1.6 billion to provide an additional 14,000 home care places to be made available over four years to help the elderly to stay in their homes for longer, an additional $50 per fortnight to go into the pockets of pensioners, and $10,000 wage subsidies for employers who hire workers over the age of 50. Aged care services in rural, remote and regional Australia will also receive a $146 million helping hand, along with an $82.5 million boost to mental health services in aged care facilities. The wider health sector will also benefit from the budget with more than $30 billion in additional funding commitments for public hospitals between 2020-21 and 2024-25, guaranteed funding to protect Medicare and the Pharmaceutical Benefits Scheme, and more than $33 million to go to Lifeline Australia to support Australians with a mental illness. various packages to support our farmers, regional tourism and regional communities. Out of these spending packages, the ACT will receive over $300 million in school funding and $403 million for the Canberra Hospitals, which is ultimately good news but will be spread out until 2024. Having faced significant criticism surrounding the anticipated level of spending in the lead up to the budget announcement with suggestions that we should instead be considering Australia’s debt levels and focusing on budget repair, the Government seems to have taken the ‘election approach’, delivering a budget designed to appease the majority of voters. This is clearly a budget aimed at winning an election. The coalition has learnt lessons from horror budgets of the past which squeezed lower and middle income earners. Instead, they have taken a windfall gain of $6 billion in additional revenue as an opportunity to spend their way to victory at the next election. This is a surprise from a government that was telling middle Australia that paying down national debt was the number one policy. The policy now seems to be to win back the trust of the Australian voter rather than rely on economic rationalist rhetoric. This is a good budget in that it takes a more balanced approach with spending helping to drive growth. While we were told not to expect to see significant tax cuts to personal income tax, the budget unveiled a $13.4 billion package to introduce a range of income tax cuts over four years. In the short term, this will only result in relatively modest reductions to income tax for low to middle income earners, putting an extra $200 to $530 in the pockets of those earning up to $90,000 each year to provide some immediate relief to household budgets. A medium-term plan to take effect from 2022-23 will introduce a new tax system designed to tackle bracket creep, with the top threshold of the 19 per cent tax bracket increasing from $37,000 to $41,000 and the top threshold of the 32.5 per cent tax bracket further increasing from $87,000 to $90,000. The 37 per cent tax bracket will then be abolished entirely from 2024, reducing the number of tax brackets to provide a simpler and flatter income tax system which will result in an estimated 94 per cent of tax payers paying a marginal tax rate of 32.5 per cent or less. They also delivered on their word to fund the National Disability Insurance Scheme (NDIS) through means other than an increase to the Medicare Levy, making a commitment that the scheme was here to stay with the levy to remain unchanged. These are tax cuts that will impact on low to middle income earners. High income earners have been quarantined from them as the government increasingly takes the policy initiative away from Labor. This has been done by using a rebate system that stops high income earners taking advantage of lower tax rates. Australian businesses will also benefit from corporate tax cuts designed to encourage growth and investment, the creation of new jobs and higher wages for employees. Small to medium businesses with an annual turnover up to $50 million will benefit from tax cuts as part of the Ten Year Enterprise Tax Plan, which will also increase the unincorporated tax discount rate, lift the small business entity turnover threshold and extend the access to a range of other tax concessions. Small businesses will also benefit from the extension of the $20,000 instant asset write-off to encourage them to replace or upgrade assets and reinvest in their business. We’ll also see a crackdown on multinationals who aren’t paying their fair share of tax through tighter rules on stapled structures, strengthened thin capitalisation rules, and a broadened scope of large multinationals subject to the Multinational Anti-Avoidance Laws (MAAL) and the Diverted Profits Tax (DPT). The ACT can breathe a sigh of relief that we have been largely ignored in the budget. After a series of attacks on the Public Service in previous budgets, it is good to see some growth, with an estimated growth of 900 non-defence jobs. Most of these jobs will be in the ACT as the Home Affairs department continues to expand. There will of course be some job losses, but overall, we will gain. While the Budget announced a huge infrastructure spend of $25.4 billion, once again, the ACT will miss out on big infrastructure spending. Elections, however, are not won by ACT votes and we only got $100 million each for a Monaro and Barton highway upgrade. Overall it was a good budget that didn’t do a lot of harm to anyone but a little to help a lot. Clearly, it is designed around the next election with many of the promises. After this, it’s either win or let Labor take the damage from unpicking the middle income earner tax relief. For a full run-down of Andrew’s take on the 2018 Federal Budget outcomes, tune into the RiotACT Facebook page from 7 pm tonight where Andrew will be interviewed by The RiotACT’s own Ian Campbell, discussing everything from spending to tax cuts. Andrew Sykes is a partner at RSM in Canberra. All opinions expressed in this article are his own. We’ll see what happens in the section 44 by-elections, but right now, the over-hyped “simpler, fairer tax plan” (where have we heard those words before…..?) in this Budget is looking like another botched job from the federal Government. Lower income families and individuals who are being squeezed hard by stagnant incomes and rapidly rising costs for many of the unavoidable costs of life are supposed to be glowing with humble gratitude at a tax cut of between $4 and $10 a week, with a few more crumbs down the track when the threshold for the 19% bracket is nudged up a little – and that’s it, because we’re being told it’s a complete plan for the next seven years or so. Seriously? Not surprised Zed’s keeping low, delivered bugger all again for the ACT. What did Katy Gallagher achieve? She’s not in the party in government is she? So you have to be in government to achieve something for your electorate? Interesting position, so what you’re saying is that three quarters of our representatives are useless because they’re members of the ALP. Although it did look like there was some good road funding in the budget and I see there’s now to be a federal inquiry into light rail stage 2 to ensure that proper planning processes and optioneering take place and we’re not forced into a wasteful and inefficient system like stage 1. It’s the usual response from the liberal apologists about those in opposition in the MLA. Oh and light rail stage 2 you mean stick their beaks into issues that are not theirs? Whilst they have every right to discuss/approve a route through the triangle they are not there to examine Act planning (which is what I assume you are having a go at) not are they there to determine if the line is a waste or not. But no doubt zed will try and drive it that way. Bugger, beat me to it. Katie’s no longer on opposition but Zed’s in Goverment not, that you’d know it. Didn't do a lot of harm? What budget were they watching? They've done a fantastic job of not committing $200m to ACT roads by not including it in the forward estimates. Apparently we'll get a bit of blackspot funding to tide us over until 2023-24 at the earliest. Not to mention more job losses and relocations across a variety of departments. That's mostly due to his private pension arrangements. He had no choices about his government pension. I’m just glad that we’ve moved past the stage where the first response of Liberal governments is to soak the poor by cutting welfare and other social programs. I’ll never forget those terrible days and weeks prior to the 2014 Budget where my 85 year old mother was worried sick and panic-stricken that her pension was going to be taken away. I felt so helpless, I couldn’t do anything to alleviate that anxiety. All that time I was also worried that my own pension was under threat. That disgusting situation must never be allowed to happen again. Except for the fact that no one had suggested anything like cutting the pension and never would due to the political outcomes. Even suggesting reasonable changes to the pension assets test left many well off pensioners apoplectic. As a pensioner I will get $10 per fortnight and then take away my energy allowance of $14.10. But I can go to work and earn $250 per fortnight. Except I can’t carry anything heavy(arthritis) have 2 knee replacements, have difficulty with hearing(hearing aids) , vision impaired ( can’t afford new glasses in pension). So I just love this budget! For a person who won't or doesn't believe in hypothetical's his budget is full of them, Standard & Poor's thinks much the same. When will we recognise Australia's frontier wars as part of our war history? How will the Federal Budget affect Canberra families? Who will benefit from tomorrow’s budget?